This weeks creative and inspirational designs actually began late on Saturday night. Yes, Saturday night after doing 7 weddings, and in spite of my exhaustion. 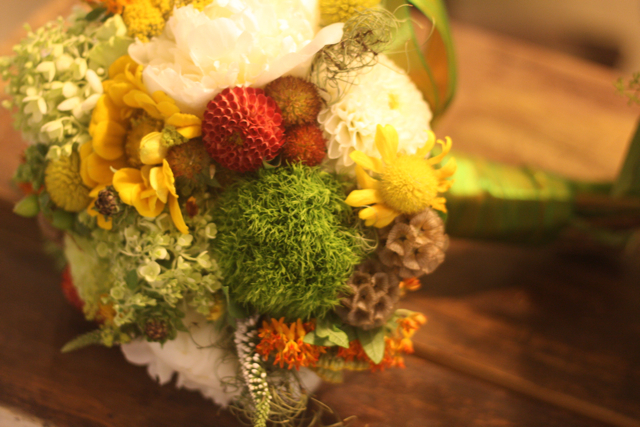 My daughter Hannah challeneged me to come back into the flower shop. She wanted to see if I could create boutonnieres like they do on ETSY. I thought she had lost her mind pushing me back into the shop but we actually had a lot of fun. I think she wanted to see if I could be as cool as the designers on ETSY, and I made her proud. 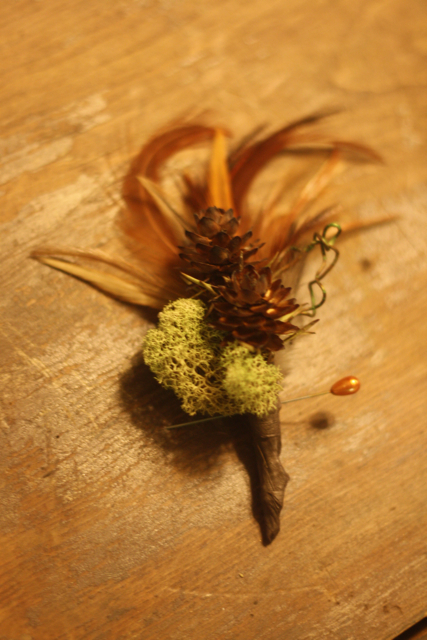 Each one of the boutonnieres were created with dried elements, feathers, or goods from the flower shop. I really love these pieces and I am always amazed that I can do this stuff. 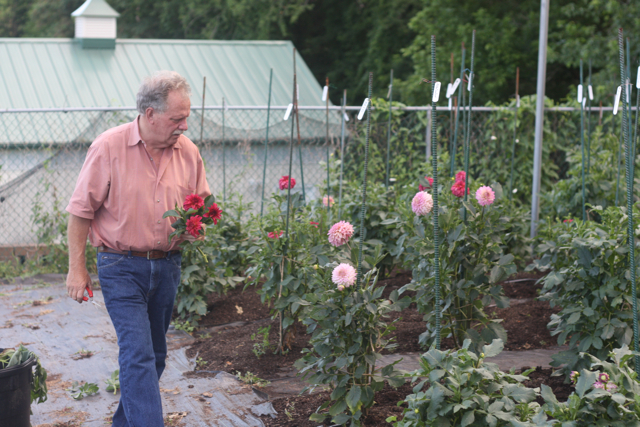 My next big thrill for the week was my trip to Don's Dahlia's. 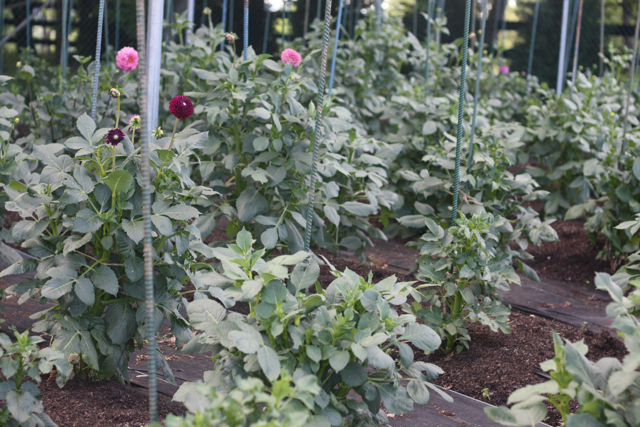 I have been missing Don since the last frost and saying goodbye to him and the dahlias last year was truly depressing. 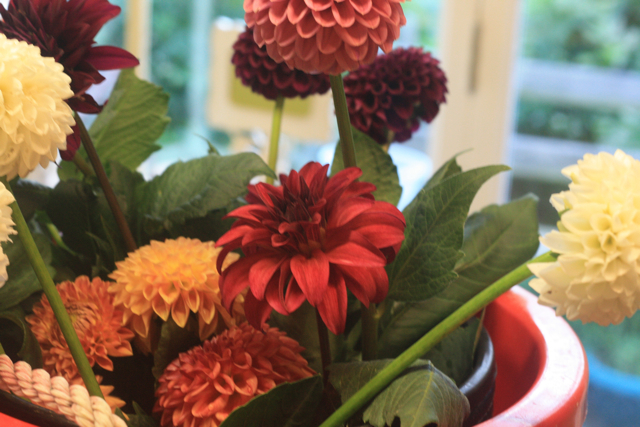 Happy days are ahead, the dahlias will be blooming in full glory in just a few weeks, lucky for me I was able to get a few early bloomers for this weeks designs. I love Don and seeing him again was so exciting. Here are a few of the goodies I claimed and some of the designs I created with them. This bouquet features hydrangea, and asclepias, yarrow, coreoposis and gooseneck loosestrife from my garden, Don's dahlias, scabiosa pods and a peony left over from last weekend. I designed this for a photo shoot that I was doing with Amber Karson Events and Photographer Abby Jiu. The shoot took place in PA, at a Frank Lloyd Wright home called Kentuck Knob. 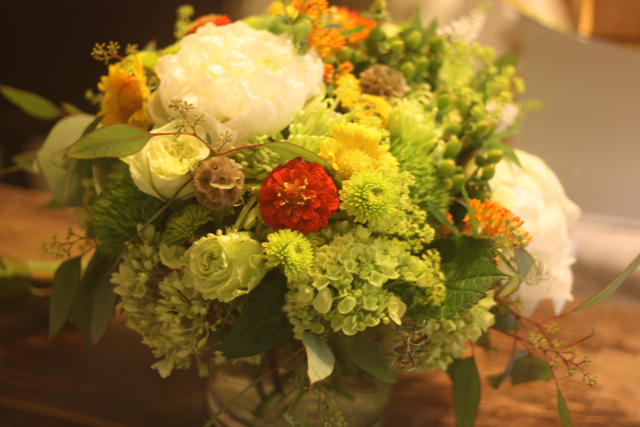 This centerpiece was the coordinating design to the above the bouquet. We had a blast creating several different looks for this shoot and I can't wait to show you the real images taken by Abby Jiu. For now you will have to live with these sneak peeks. 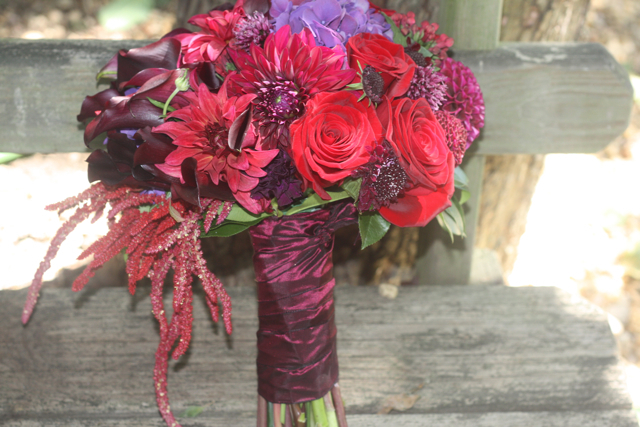 The below bouquet featured several of Don's dahlias and a whole host of others, such as black mini callas, red roses, black scabiosa, purple hydrangea, red bouvardia, purple allium, purple carnations, and red hanging amaranthus. 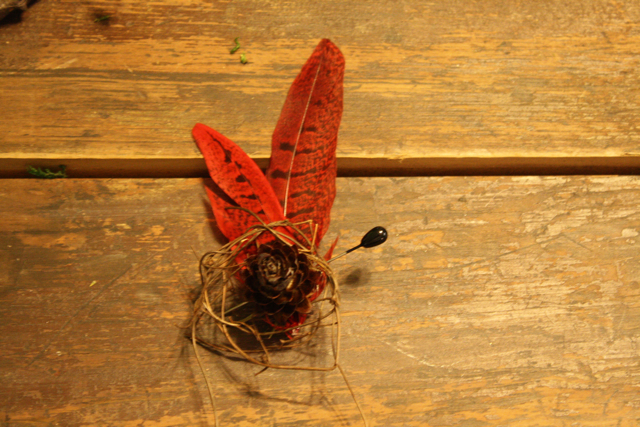 The boutonniere was a mini piece of art as well, it featured the black purple calla, the scabiosa and the red amaranthus. We also tucked Don's copper colored dahlias into this fabulous design of cream hydrangea, orange unique roses, sahara roses, hypericum berry, spray roses, and vendella roses. Don't you just love this piece? I am off on a little mini vacation with my husband so there is no "in the cooler" this week. I am finding all types of new inspiration on our little trip, I just can't seem to shut my mind down. Have a great weekend and a great fourth of July. You went back into the flower shop after 7 weddings?!? 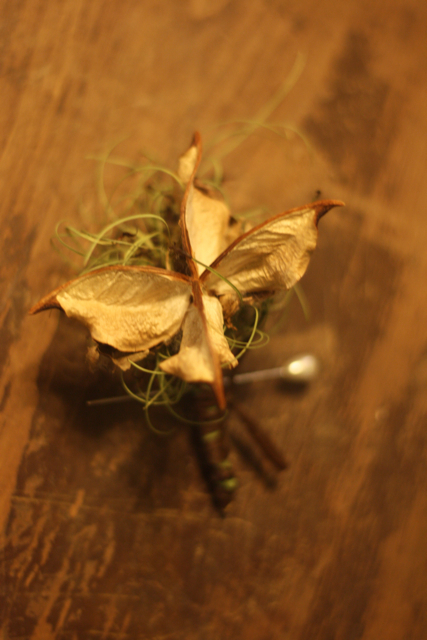 Yes, you are a rock star… Love your creative boutonnieres.